Barnes & Noble is having a good end to the year, thanks to the gift that keeps on giving -- the Nook. British book publisher Pearson (PSO) said Friday that it would pay nearly $90 million in cash for a 5% stake in Barnes & Noble's Nook division. Microsoft (MSFT) already owns a 16.8% stake, leaving Barnes & Noble with 78.2%. That was enough to offset any disappointment over Barnes & Noble's sales forecast. The bookseller said in a regulatory filing Friday that holiday sales would fall short of its expectations and Nook sales would also miss targets for the year. Investors don't seem too concerned. 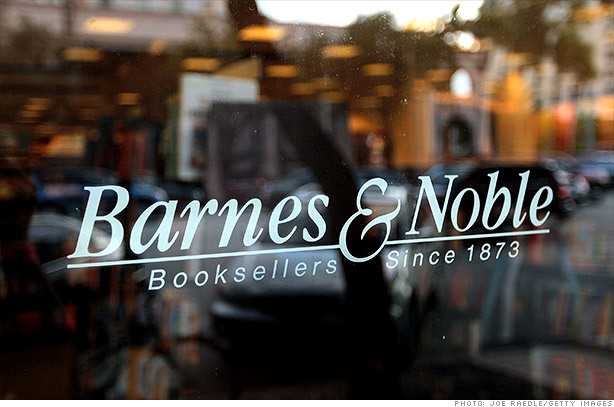 Shares of Barnes & Noble (BKS) rallied nearly 10% before pulling back a bit. And traders on StockTwits were also cheering the Pearson deal. That did seem a bit of a contrarian move but maybe investors really aren't too worried about sales falling off a cliff. It may be a whole different ballgame when the actual numbers come out but for now, investors are willing to take a wait and see stance. seems like every time we get ready to write off $BKS, it gets another slug of money from somewhere, no? sdharmar@Colarusso42 yes. Pearson investment puts nook valuation at more than $BKS itself. There's also an argument to be made for how book publishers can battle against Amazon, which not only sells boatloads of hardcover and paperback books, but which has also been on fire (pun intended) with its many iterations of the popular Kindle. Terrified may be a bit strong. But it is a good strategic investment for both sides. It gives Pearson another outlet for its books and it also opens up a new market for the Nook.